Given the current climate of mistrust and despair, it’s hard to believe that behind the scenes, there actually had been a certain level of progress made by Jason Greenblatt, President Donald Trump’s Middle East envoy, in returning trust between Israel and the Palestinian Authority. Late last year, he brokered a deal in which Israel began selling water to the Palestinian Authority at a discounted rate. Gaza is in need of major infrastructure and economic development, something that can alleviate the sense of hopelessness that has caused thousands to resort to desperate and violent attempts to change the status quo. Following the ill-timed and poorly conceived embassy move, the United States can rebuild trust with the Palestinians by immediately reinstating funding to the U.N. Relief and Works Agency, which supports food supply, access to education, health care, social services and employment. Deescalating violence in the current climate will require a level of leadership that neither Israel nor the Palestinians seem to have at the moment. To bridge this leadership gap the parties will need a U.S. administration that resumes its traditional role as an honest broker. Brad Rothschild currently serves as Chair of the Policy and Advocacy Committee. Besides Brad's important work for Ameinu, he is a screenwriter and independent filmmaker. From 1995-97, Brad worked as a speechwriter and Director of Communications at the Permanent Mission of Israel to the United Nations. 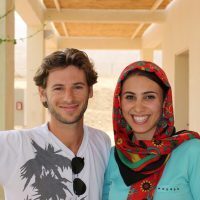 After graduating college, Brad lived in Israel for two years. During this period he worked as a research associate at the Israel Democracy Institute, a think tank advocating political and economic reform.